Had a great time with friends at the Hotel Stanford off Broadway Avenue! Lively discussion ensued. In particular, a new friend introduced me to Cleverbot. For some of you, I might be ridiculously late. As a surveying student of an Intro to Artificial Intelligence online class, I’m curious and willing to learn new methods utilizing Artificial Intelligence. 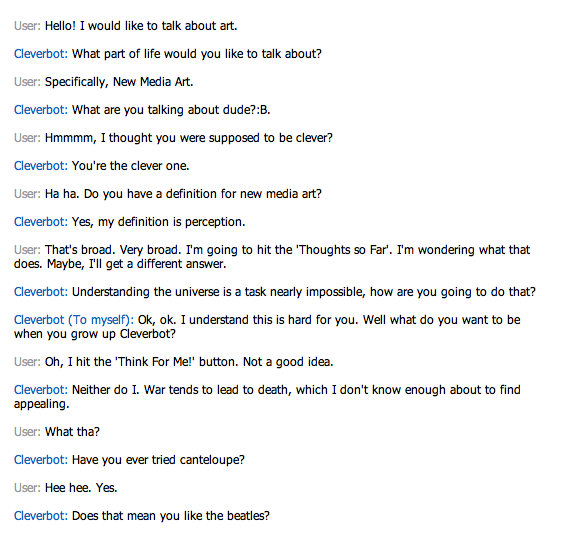 Below, you will find a screenshot of an early morning dialogue with Cleverbot. Not the most clever but it was entertaining. Trust me, I’ve heard some really unintelligible conversation between human beings! Lastly, just because Cleverbot doesn’t necessarily offer me the answer I want, does it mean it’s unintelligent? Think about it, from a GPS navigation system to Google Translate, artificial intelligence doesn’t always give the answer we’re looking for or hoping for (hope is such a human thing too). So, Artificial Intelligence isn’t so bad I guess? After all, it was developed and created by humans…hmmm. 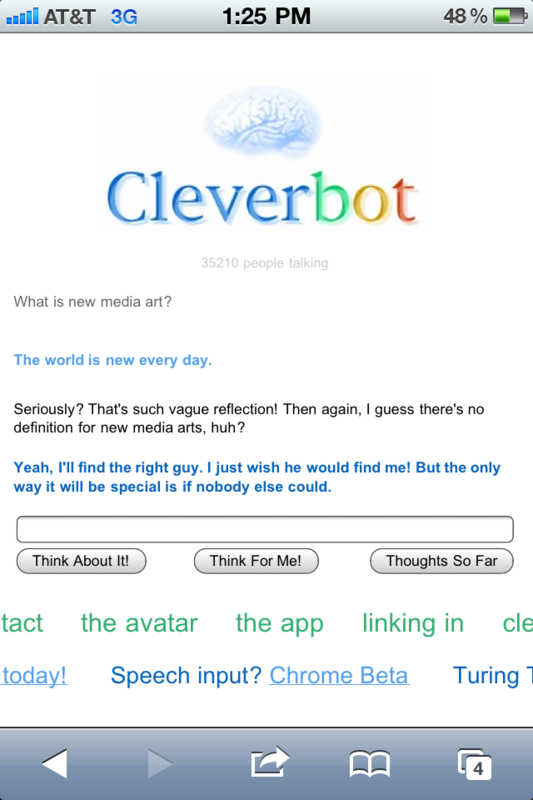 Posted in Art and Technology, Creative Coding | Programming, Multi Media, Neurology, Social Networking and tagged as artificial intelligence, arts and technology, cleverbot, new media, postaday2011.